Those adjectives aren’t typically associated with Travis Kalanick, Uber’s combative co-founder. But during 50 minutes on the witness stand in the Waymo vs. Uber trial on Feb. 6, a suit-and-tie-clad Kalanick kept his cool, meekly agreeing with most questions posed to him by Charles Verhoeven, Waymo’s lead attorney. Kalanick’s testimony is his first major public appearance since Uber ousted him as CEO in June after a scandal-plagued year. His quiet demeanor seemed designed to counteract what Waymo told the jury on Feb. 5: that Kalanick was willing to cheat and break the law to get ahead. “For him, winning at all costs, no matter what, was his culture and what he was going to do,” Verhoeven said during his opening statement. The suit in U.S. District Court by Waymo, the self-driving unit of Google parent Alphabet, alleges that Uber stole Waymo trade secrets for technology called lidar, a laser form of radar, that helps self-driving cars see the world around them. Uber denies doing so. Not in dispute: Kalanick courted Anthony Levandowski, a star Waymo engineer, to come to Uber, with a focus on addressing its weakness in lidar sensors. He agreed with Verhoeven that Waymo had the lead in self-driving, which he viewed as an existential threat to Uber’s future. 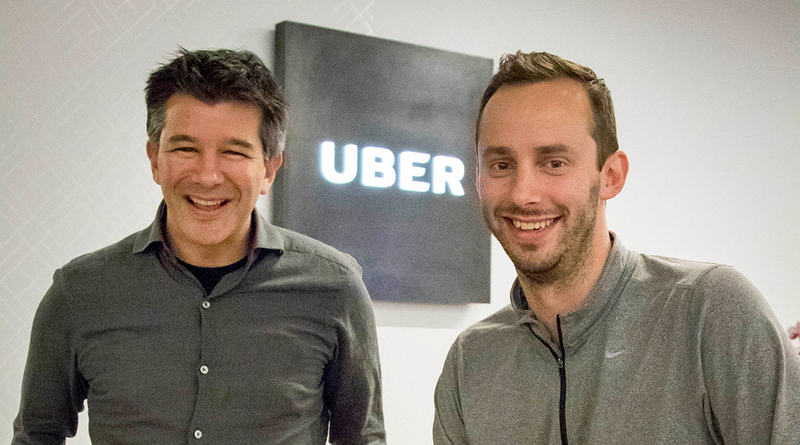 “Laser is the sauce,” Kalanick scrawled on a whiteboard during a Jan. 3, 2016, meeting with Levandowski at Uber. Levandowski was still working for Waymo at the time. Levandowki in fact did start a San Francisco company called Otto to focus on self-driving trucks. Uber acquired it in summer 2016 but had already signed a deal much earlier that year, evidence showed. Levandowski has asserted his Fifth Amendment rights against self-incrimination in declining to testify in the case. Levandowski’s downloads: Gary Brown, a Google security engineer, gave a detailed description of the forensic computer analyses he conducted to determine that Levandowski had downloaded 14,107 files from a Google server containing self-driving car design files. Levandowski downloaded the data to his Google laptop, then connected a memory card reader to it for eight hours, then erased the laptop entirely, Brown testified, showing logs that backed up his analysis. The download happened in December 2015, a month before Levandowski quit Waymo. Telltale email: William Grossman, a Waymo hardware engineer, testified about an email he received in December 2016 from a vendor called Gorilla Circuits. Attached was a file labeled as being from Otto, Levandowski’s startup, which by then was owned by Uber. “I was confused and surprised; it looked like one of our systems,” he said of the schematic for a circuit board for lidar sensors. That stray email helped launch Waymo’s suit against Uber. Bill Gurley dispute: Benchmark partner Bill Gurley, a former Uber board member whose firm sued Kalanick in August, dropped the lawsuit after Softbank’s $10 billion investment in Uber. Waymo wants him to testify to something he said in a deposition — that he believes Kalanick committed fraud on Uber’s board by not sufficiently disclosing facts underlying the Otto acquisition. The Benchmark lawsuit made the same point. Waymo wants Gurley to say so on the stand. Uber objects on the grounds that Gurley didn’t know about the issues with the sale until many months later. Alsup said he’d rule on the issue later.